Do you ever have nights when you just don’t feel like spending a lot of time in the kitchen? I know you do. I can usually tell early in the afternoon when it is going to be one of those nights because I am either dreading the process of preparing what we’ve got on the menu or I have no interest in thinking about something to cook. Leftovers come in handy on such nights as do Amy’s pizzas stashed in the freezer. Sometimes a quick batch of guacamole won’t seem too daunting and Brian and I will spend the evening snacking on seven-layer dip, other times we resort to picking up the phone and ordering various tofu dishes from our favorite Chinese take-out place. But my favorite no-effort meal is, by far, of the crusty loaf of bread, hard cheese and simple salad variety. Radishes and I don't have much of a history. 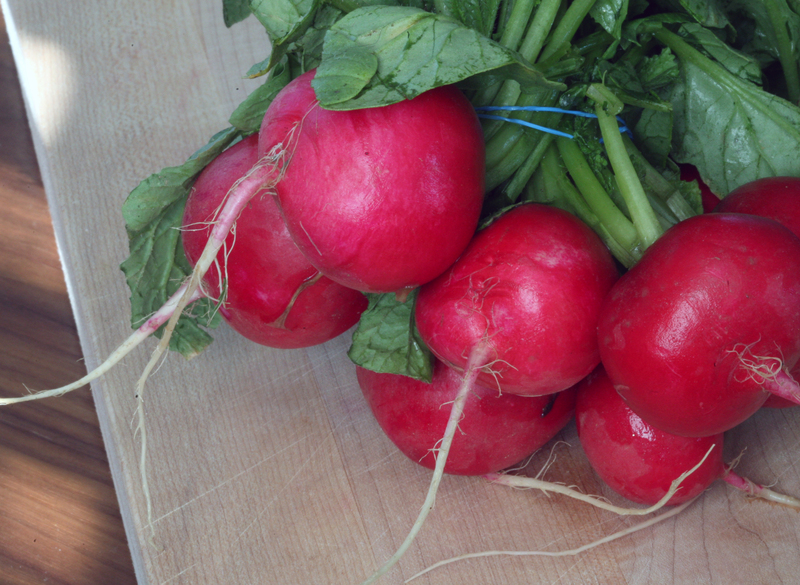 In fact, until Sunday, I didn't think that I even liked radishes. But as I stood in front of the deep scarlet globes in the middle of a very busy produce department and racked my brain trying to think of why I didn't like them I could not come up with one recollection of ever actually eating a radish. Maybe once or twice, shaved over baby greens on a salad, but never on their own or displayed proudly and prominently as a key ingredient in a dish. And, since I'd been reading Molly's book while in West Virginia and had come across this recipe, I decided it was time to give the bright red beauties a fair review. I even, coincidentally, picked up Plugra. The same salted European butter that Molly recommends on Orangette for this very treat, although I didn't know it at the time. Armed with a French baguette I arrived home and happily announced to Brian and our last lingering house guest that we would be having sliced, salted radishes on fresh bread for dinner, along with a salad. Though they weren't convinced at first (and we did add a hunk of fresh sheep's milk cheese from the local farmer's market to the mix, separate from the radish ensemble) they came around after the first bite. 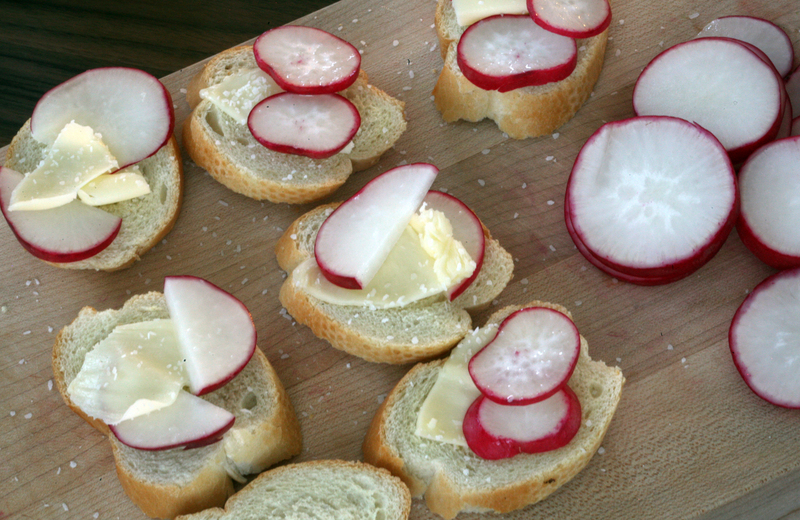 For thinly sliced radishes with delicately shaved butter and sea salt on a fresh baguette is a delicious combination. Truly. So impressed was I with my first official radish experience that I came home from the office today to make a salad with radishes for lunch, stopping first at the local market for an avocado. I made this soup [scroll to bottom] for dinner last night and knew that it was destined to be my mid-day meal, but couldn't resist the urge for fresh Spring greens to accompany it. 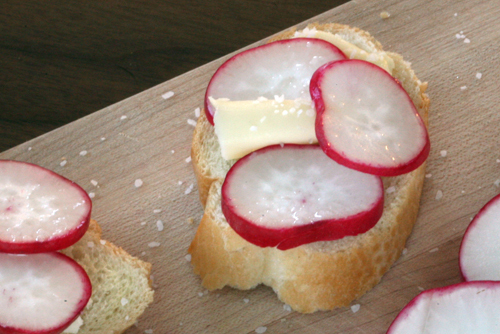 A quick search on epicurious for a good radish salad [remember, I'm new to them] yielded this recipe. 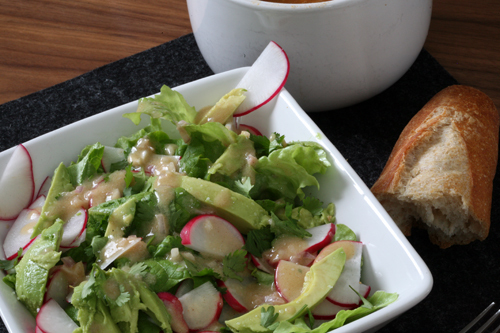 The avocado and fresh cilantro seemed to be the perfect compliment for the radishes and ultimately my spicy tomato-based soup, and I wasn't disappointed. Oh radish, I'm your newest fan. The recipe describes a lovely presentation for the salad on the plate, but in the name of time [and simplicity], I just dumped everything in a bowl. It was still delicious, although the display would be lovely if you have the time. Whisk last 4 ingredients together to make dressing. 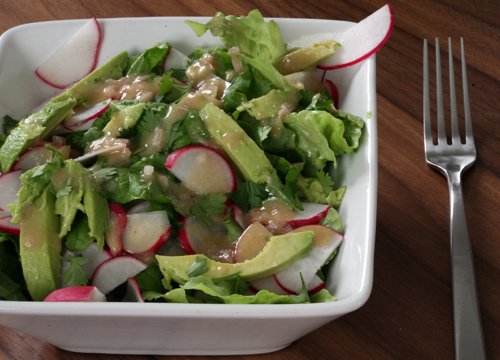 Divide first 4 ingredients into 2 bowls and drizzle dressing on top. The recipe describes a lovely presentation for the salad on the plate, but in the name of time [and simplicity], I just dumped everything in a bowl. It was still delicious, although the display would be nice if you have the time.